Frihedsmuseet in Copenhagen, Denmark, maintains an on-line searchable database (Modstandsdatabase in Danish) on Resistance personnel. For each of the Resistance members who helped Bertie and Mitchell, I list the Person # in addition to the person’s name to facilitate finding that person’s Frihedsmuseet database record. The three safe houses in Jutland in which Mitchell and Bertie were protected from 17 March through 4 April were owned by married Resistance men. Two of the married couples had a young child at home, and one of those couples also had the wife’s sister in residence. Although these women were not considered members of the Resistance and did not receive helper certificates for protecting Allied airmen, they definitely deserve full recognition for the risks they took in housing Allied airmen and for the day-to-day care they took of these men. Consequently, I acknowledge wives and other family members along with the men under the Resistance Helpers category. 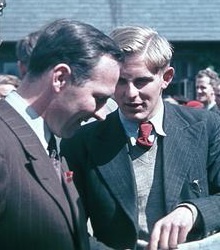 School teacher Nørby Christensen questioned Mitchell and Bertie at the Fiskers’ farm on the night of 16/17 March 1945 to ascertain that they were genuine Allied airmen. He also inspected their clothing and items such as identity cards. Because the two Australians would hence forth be accompanied by Resistance members, they needed to be disguised as Danish civilians to minimize risking the well-being and lives of their helpers if stopped by German authorities. Nørby provided civilian clothing, for which he was reimbursed Kr 100 by I.S.9 and MIS-X in March 1946. Other items that would identify Mitchell and Bertie as Allied combatants were also removed. Nørby took possession of Mitchell’s watch until it could be returned to him, and the uniforms were buried on Fiskers’ farm. Nørby received Grade VI helper certificates from the British and American governments. Brothers Gunnar Birk and Sigurd Birk were members of a Resistance group founded in August 1944 in Ikast that received weapons and other supplies air-dropped at remote locations by the SOE. The Ikast group was coordinated by Ole Engberg, formerly on Horsens and Copenhagen, but based in Herning from late 1944 onwards. On the night of 16/17 March 1945 Ole Engberg, the Birk brothers, and other members of the Ikast group went out to a dropping site code-named “Ejnar” located at Isenbjerg to receive an expected drop of weapons; however, no aircraft came. Having waited in vain for a load of weapons, the group dejectedly returned to the Birks’ farm where they received a message about two Allied airmen near Funder. Re-invigorated, members of the group accompanied Ole Engberg to collect the airmen and take them to Ikast. In his diary, Sigurd Birk indicates that his brother Gunnar went with Ole Engberg to Funder, and an article in Herning Avis on 8 November 1945 likewise indicates that Gunnar Birk accompanied Engberg. In a 2002 interview for Dansk Militærhistorie, Ole Engberg reported that it was Sigurd who accompanied him. In his 1977 report, Merv Bertie recollected that 2 or 3 (un-named) men rode with him and Mitchell on the back of Engberg’s truck. The Frihedsmuseet database lists both brothers as giving assistance to evaders (flugthjælp), and both Gunnar Birk and Sigurd Birk received Grade V helper certificates. In addition, they also received a joint reimbursement of Kr 439 for clothing. Presumably the Birk brothers had contributed some of the civilian clothes that Bertie reports they wore on the drive from Funder to Ikast. During his years of Resistance activities, Engberg had various false names and identity cards. In their MI9 debriefing reports in 1945 and in Merv Bertie’s memoir of 1977, Bertie and Mitchell refer to Engberg as “Big Boss”, clearly in recognition that he was a leader with authority. Indeed Engberg’s primary Resistance activity at the time was as district leader in the Herning area for receiving air-dropped weapons and supplies needed to support Resistance activities. In this capacity Engberg was known by his Resistance code-name “Bruhn” (sometimes also spelled Brun or Bruun). Engberg was responsible for organizing reception teams to go to the dropping site, guiding aircraft to that site using a ground-based Eureka transponder that received signals from a Rebecca transmitter aboard the supply aircraft, then helping to spirit away the weapons and ammunition to safe hiding locations for subsequent distribution to their destinations. The large quantity of dropped materiel needed to be moved away from the reception site rapidly, before German soldiers alerted by the sound of aircraft reached the site. For that task, Engberg had access to a truck named “Dorte” which he drove in the guise of a brown-coal worker delivering coal. Engberg drove in the guise of a lignite worker when gathering supplies dropped by the SOE and when transporting Mitchell and Bertie between safe houses. After returning in the pre-dawn hours of 17 March 1945 from a fruitless wait for a supplies drop that never arrived, Ole Engberg received the news at Sigurd Birk and Gunnar Birk’s farm that Allied airmen were at a farm near Funder. Ole Engberg drove in the truck “Dorte” to the Fiskers’ farm, where he was told that two men were in the hay loft. When he saw one of them, he said in English “Welcome to Denmark” and repeated the welcome when he located the second man. After assuring himself that two men were genuine Allied airmen, Engberg was responsible for ensuring that, from then on, Bertie and Mitchell were protected by Resistance members. On 17 March, Engberg drove Mitchell and Bertie to the safe house of Arnold and Naomi Petersen in Ikast, about 20 km to the west of Funder. Then on 22 March, he transferred the two Australians from the Petersens’ house to another safe house, this time in Herning, about 10 km west of Ikast. Engberg saw the two Australians at least one more time when he took them to spend an evening in the apartment of his cousin Louise Zeuthen in Herning. During four visits to Ole and Ellen Engberg in Copenhagen in 2011, 2012, and 2013, Gail and Dan Michener were entertained by Ole’s many tales about his war-time experiences which ranged from carefully cycling home to obtain a pin to deactivate a live grenade he was carrying, to convincing a German soldier to let them pass or otherwise he would trigger an explosion that would kill them both, to throwing water to revivify a man who fainted when Ole advised him to stop talking about Resistance activities. In addition to driving the two Australian evaders Mitchell and Bertie to safe houses in Ikast and Herning, Engberg also assisted two German defectors. As noted in his obituary, “Ole Engberg never boasted of his exploits in the Resistance. … In his eyes the Resistance had been a necessity, but not something you need to talk about, and when peace came, he put the story behind him.” One consequence of Ole Engberg’s humility about his war-time contributions and his Grundtvigian philosophy was that he did not submit a helper report to the Allied authorities, and consequently did not receive helper certificates for the risks he took in transporting Bertie and Mitchell from Funder to Ikast and later from Ikast to Herning. One of the reasons why Ole Engberg had chosen the Petersens was that Arnold had an excellent command of English because he had spent a period in the USA during his days as a seaman. He married Naomi in 1933, and they moved to her family’s smallholding, Sandhus, on the northwest edge of Ikast in 1937 where they built their home. Naomi’s mother usually lived with them in 1945, but she happened to be visiting another family member at the time of Bertie and Mitchell’s stay, which was fortunate as she was unaware of her son-in-law’s Resistance activities. Any remaining British clothing or items still on Mitchell and Bertie were destroyed at the Petersens’ home, but in his letter to Bertie’s daughter in 1988, Arnold Petersen confesses “We were told to burn all what they wore and had as belongings … and there I cheated and hid away a tiny compass – the size of an american ten cent piece”. As mementoes of their time with the Petersens, Naomi gave Mitchell and Bertie an ear-ring each on their departure and Arnold sent them several of his paintings post-war. One of the three paintings that Stoney Mitchell received showed the fields that Mitchell and Bertie could see from the safe house. Petersen received Grade V helper certificates from the British and American governments. Original photograph in Søby Brunkulsmuseum photographed by Gail Michener 15 June 2011. Alfred Balle Pedersen was a business man whose various interests included a garment factory in Herning and a lignite mine at Søby. Mitchell and Bertie referred to him as “The Manager” in their reports. In 1942 he bought a partially built house and immediately made modifications to the upper level so as to incorporate hidden rooms under the eaves that were accessible from the upstairs bedrooms via crawl spaces opening from the upstairs landing. 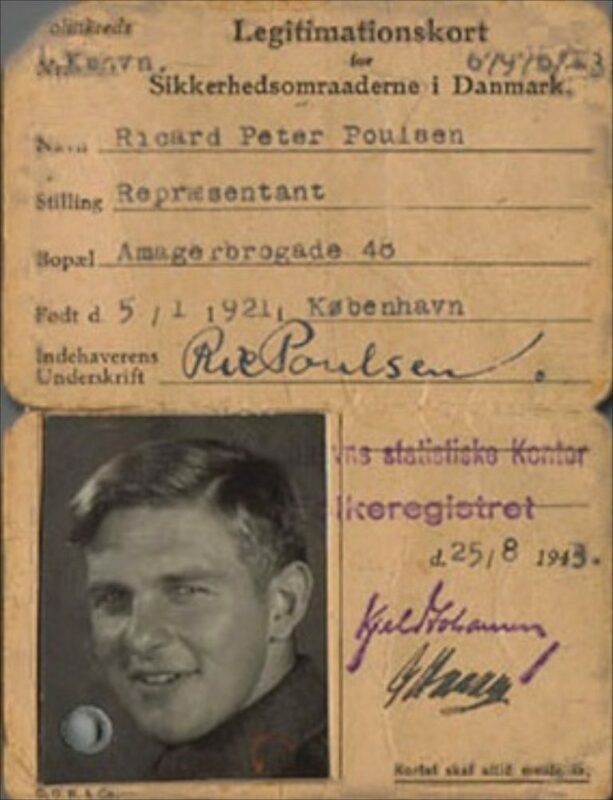 Pedersen had the intention of hiding people, primarily Danes who were at risk of arrest by the Gestapo, and to this end he dismissed the family’s maid and replaced her with a trusted family member, his sister-in-law Frida Jensen Bjerre. The people protected by the Pedersen household included family members, various Resistance members (one of whom later married Frida), and Mitchell and Bertie. The Pedersens’ 5-year-old son Poul Helge was told he was never to go upstairs, but one time he climbed up un-noticed and saw Mitchell and Bertie in a bedroom, though they did not see him. He then reported to his mother and aunt that there were two strange men upstairs, but they convinced the boy that those men were electricians doing repairs. Years later Helge realized that they were actually Allied airmen. On weekends, when Helge visited his grandmother, the two Australians were able to come down to the living room, from where they could observe the German soldiers exercising in the commandeered school grounds across the road. Pedersen received Grade V helper certificates from the British and American governments. 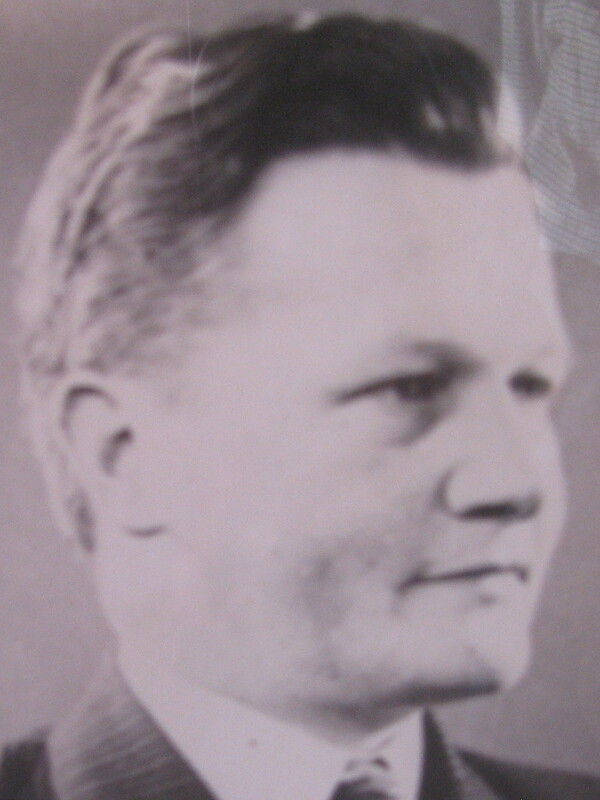 Toldstrup’s birth name was Anton Ingersøn Jensen, and in his pre-Resistance career he worked as a Toldassistent (Customs agent) for the Danish Customs Service, Toldetaten. Tolstrup (without a “d”) is a common Danish word, used both as a place name and a surname, but Toldstrup is a unique name that plays on Jensen’s employment as a tolder (tax collector) and was given as a cover name to Jensen by Resistance leader Flemming Juncker. Toldstrup quickly became known just by that name, and subsequent to WWII he officially changed his name to Toldstrup. Toldstrup’s major Resistance activity was organizing the reception of weapons throughout a large area of Jutland. In that capacity Toldstrup was in frequent telegraphic contact with the British SOE regarding which of several hundred reception sites should be used for that night’s weapons drops. Mitchell and Bertie only met him for a few hours when, in the apparent capacity of a Danish officer in the Statens Civile Luftværn (National Civil Air Defence), Toldstrup and his driver transported the two Australians from Herning to Ebeltoft. In his memoir written in 1977, Merv Bertie refers to Toldstrup as the “Chief”. Of 688 Danes who received Helper Awards from the British IS9 (AB), Toldstrup received the second highest recognition for his assistance to Allied airmen. Toldstrup’s main role in helping Allied aviators was indirect, through organizing escape routes, but occasionally he personally provided assistance. In May 1944, Toldstrup collected USAAF Bombardier 2.Lt Floyd Holmes and USAAF Radio Op. T/Sgt Jack C. Wengert from a farm near Videbæk and drove them to a safe house in Holstebro. By April 1945, when Toldstrup transferred Mitchell and Bertie from Herning to Ebeltoft, he was very much a wanted man by the Gestapo. His willingness to place himself at such great personal risk was typical of the energy and bravery that typified all Toldstrup’s Resistance activities. 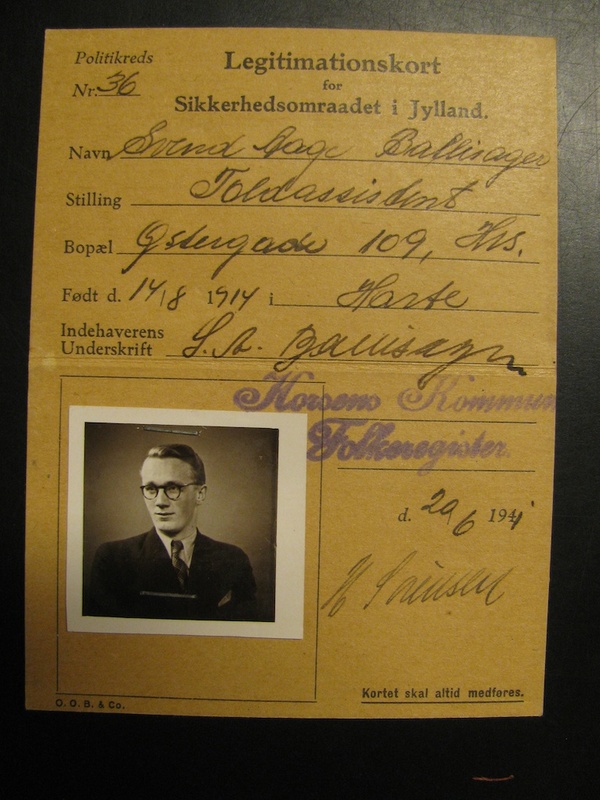 False identity card for Svend Aage Ballisager. Original document in Ebeltoft Byhistoriske Arkiv photographed by Gail Michener 20 October 2011. 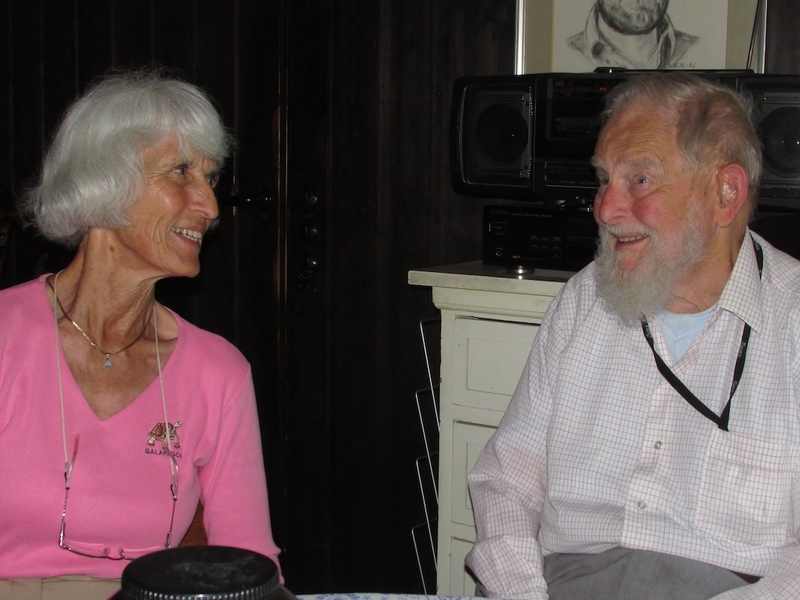 When asked in autumn 1944 whether he was interested in joining a newly formed weapons-reception Resistance group in Ebeltoft, Svend Aage Ballisager, with the full knowledge and support of his wife Gudrun, immediately agreed. 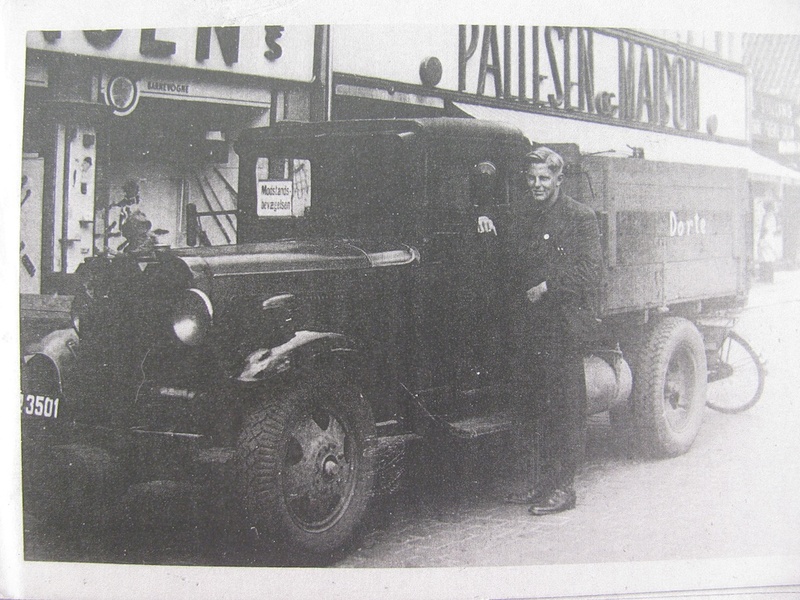 Like Toldstrup, Ballisager’s civilian employment was as a Toldassistent (Customs agent) for the Danish Customs Service, Toldetaten. In July 1941, Ballisager was transferred from Horsens to Ebeltoft, where one of his major functions was to clear shipments of stone and gravel loaded from silos 200 meters off the Danish coast at Øerhage, south of Ebeltoft, and bound for Germany. Ballisager’s familiarity with this remote loading facility proved useful as a site for unloading weapons smuggled from Sweden for distribution to Resistance groups. The work was exhausting as the smuggled cargo needed to be unloaded off-shore into a boat, rowed to shore, transferred to a truck, then hidden in nearby plantations. On Monday 2 April 1945, Ballisager was approached by senior Resistance members Svend and Bruun to undertake an additional task. The next boat arriving with smuggled armaments would return to Sweden with two Allied airmen who needed to be hidden in Ebeltoft until they could be boarded. The Ballisagers agreed to protect the airmen. Mitchell and Bertie arrived at the Ballisager’s apartment shortly after 11:00 pm in the company of two Resistance members, one of whom was Toldstrup – though Ballisager was not aware of his identity or their shared careers as Customs agents at the time. Mitchell and Bertie were immediately made welcome by Gudrun Ballisager, who spoke English, and over the next 2 days they spent most of their time in her company playing various card games. Also present in the Ballisagers’ apartment was their 3-year-old daughter Sine-Marie. In the evening of Tuesday 3 April, Ballisager took the two Australians for a walk to visit the home of another Resistance member S. A. Einar Høst where they enjoyed coffee and musical entertainment. For security reasons, Mitchell and Bertie did not know their hosts’ names while they were staying with them, but the Australians made entries in Gudrun’s autograph book. In his 1977 report, Merv Bertie refers to Ballisager as a Customs officer. When word arrived that the fishing vessel “Freden” was coming, Svend and Bruun drove Bertie and Mitchell by car from Ebeltoft to Øer on Wednesday evening 4 April while Ballisager and others from the weapons-reception group bicycled there. Everyone got involved in unloading fish crates, which were actually filled with Plastic Explosive, rowing them as near to shore as possible given the heavy seas and low tide, transferring them onto the bridge from the silo, carrying them the rest of the way to shore, and loading them into waiting wagons. In their MI9 debriefing report, Mitchell and Bertie reported that they spent 3 hours unloading cargo. After the last crates were taken off “Freden”, Ballisager said his farewells to the two Australians. For Ballisager the night was far from over as the goods still needed to be hidden before morning. Ballisager received Grade V helper certificates. Although Ballisager’s name does not appear in the Frihedsmuseet data base of Resistance members, his Resistance activities are reported in several chapters of the book “Hilsen til Lucas, Helmer og Abel” by K. Chr. 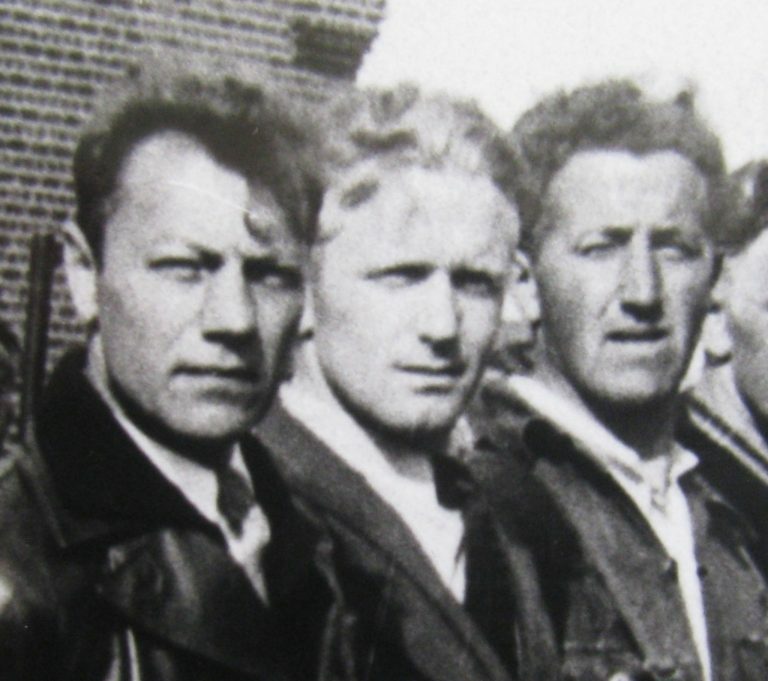 Jensen, F. R. Pedersen, and J. Vedsted. Ballisager also wrote an article entitled “Toldassistent ved et lille toldsted under besættelsen”, which appeared in Toldhistorisk Tidsskrift in 1985, describing his war-time experiences in Ebeltoft. To facilitate smuggling of weapons, ammunition, and people between Göteborg in Sweden and various Danish ports, Toldstrup arranged for the purchase of the fishing vessel “Freden”. “Freden”, code named SP 100, was owned by the Jutland branch of the Danish Resistance and operated with the crew of Ulf Henrik Svendsen-Tune, Henrik Henriksen, and Johannes Rasmussen by Dansk Hjælpetjeneste out of Göteborg. Late on Wednesday 4 April 1945, Mitchell and Bertie were driven to Øerhage, 6 km south of Ebeltoft, where they used the suspension bridge to the stone and gravel silo operated by Aarhus Sten og Grus Kompagni to reach the boat “Freden”. After assisting with unloading of fish crates that contained Plastic Explosives, Mitchell and Bertie were safely taken across the Kattegat to Göteborg, Sweden, arriving in the evening of 5 April.